Nathaniel Lord Britton (1859-1934), the first Director of the New York Botanical Garden, was born on 15 January 1859 at New Dorp, Staten Island, New York, son of Jasper Alexander Hamilton Britton and Harriet Lord Turner. His parents envisioned a religious career for their son; instead, John J. Crooke and John Strong Newberry, two "all-around naturalists" of Staten Island, nurtured his native curiosity about the natural world and guided him easily into a botanical career. From the beginning Britton created a sizeable botanical collection, and his father reinforced his interest with visits to the Columbia College herbarium. As the young Britton's education progressed at the Staten Island Academy, Crooke, a neighbor of the Brittons, convinced his parents to allow him to attend the Columbia College School of Mines. 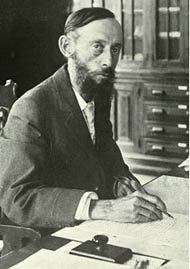 In 1875 Britton began his undergraduate study under John Strong Newberry, who taught geology, mineralogy, and paleobotany at Columbia. Soon after, again at the instigation of Newberry and Crooke, Britton and his friend Arthur Hollick joined the Torrey Botanical Club. This organization proved to be of enormous importance to Britton. He published his findings in its bulletin and discoursed with the finest botanists of the age. Aside from his formal schooling and private study, he used the forum of the Torrey club to press on with his development as a botanist and administrator in a very public fashion. He led the club toward affiliations in New York's scientific community and used it to launch the project of planning and creating a botanical garden. It was said that he never missed a club meeting (until well advanced in age). In 1879 Britton graduated from the School of Mines with a bachelor's degree "Engineer of Mines" to become an assistant instructor under Newberry. He assumed Newberry's position in 1886. With Hollick he published "The Flora of Richmond County, New York." From 1879 to 1884 the two worked as field assistants with the Geological Survey of New Jersey, traveling to the Wyoming Territory to collect fossil specimens. It was also in the year 1879 that Elizabeth Gertrude Knight joined the Torrey club. She and Britton married on 27 August 1885, a marriage grounded in mutual interests and a close collaboration in botanical research and education. Britton completed and published his Ph.D. thesis, A Preliminary Catalogue of the Flora of New Jersey, in 1881. Ever involved with the Torrey Botanical Club, he accompanied its local collecting expeditions into the wooded environs of New York City. Of one excursion into the Bronx he commented that "it was this trip that gave me my first knowledge of the natural beauties of the Bronx Valley." For the deep impression that it made, Britton later suggested this area for the site of the New York Botanical Garden. Visiting the Royal Botanic Gardens of Kew, England in 1888 with Nathaniel, Elizabeth too obtained vivid impressions in which she realized the need to establish a botanic garden in the United States. Consequently, she addressed a meeting of the Torrey Botanic Club on 24 October 1888, relating their experiences at Kew to stimulate interest in a similar garden in New York. Here was a turning point in the life of the Brittons and in that of New York City, for the couple seemed to acquire a personal mandate to make this happen. In the beginning of 1889 the club circulated a public appeal to establish the New York Botanical Garden. Emerson Sterns, Arthur Hollick, Timothy Allen, John Strong Newberry, Addison Brown, Henry Hurd Rusby, Thomas Hogg, and Nathaniel Lord Britton comprised the club's committee in this endeavor. In 1891, as Britton became Adjunct Professor of Geology and Botany at Columbia University, in charge of its herbarium and botanical library, the NYBG was incorporated, based on legislation enabling the state to transfer public lands to a private corporation. Four years later, in 1895, Britton resigned his prestigious post at Columbia to become the garden's first Director-in-Chief. Britton's ties to Columbia remained strong, for he carefully crafted contractual agreements with the university to ensure reciprocity in educational goals common to both institutions. The transfer of the John Torrey collection from the university to the NBYG was significant in this respect. The NYBG's first board of managers was composed of Andrew Carnegie, J. Pierpont Morgan, Cornelius Vanderbilt II, and Nathaniel Lord Britton. In the decade of the 1890s Britton stood at the pinnacle of a career in which his energy and acumen as a leader seemed boundless. Always in the thick of botanical research and publication and firmly dedicated to goals set for the NYBG, he proposed in 1890 at a meeting of the New York Academy of Sciences a plan for a formal cooperation among the scientific societies of New York City. This led to the establishment of The Scientific Alliance of New York, an umbrella organization and forum for collaboration and the exchange of ideas. The Alliance, which flourished until 1907, was a yet another manifestation of Britton's unique talent of managing and sustaining shared purposes and of forging links among the city's scientific organizations. His influence thus extended over the Torrey Botanical Club, Columbia University, the New York Academy of Sciences, the Botanical Society of America, the Staten Island Institute of Arts and Sciences, the New York College of Pharmacy, and many others. At a meeting of the Botanical Club of the American Association for the Advancement of Science in 1892, Britton developed and promulgated a set of rules of botanical nomenclature, known as "The Rochester Code" (later, with modifications, it was called "The American Code"). He embraced through the Rochester Code the concept of "type," a herbarium specimen with which a name is permanently associated, and a rigid system of assigning priority of names to botanical entities. Britton's efforts to re-systematize nomenclature were based on his own careful consideration of the classification of plants he discovered (or re-classified) as well as close collaboration with botanists in the United States. The nomenclature issue unfortunately led to controversies that pitted European taxonomists against American to become a battleground of competing philosophies left unresolved until Britton's death. An important associate during these years was Judge Addison Brown, who had drafted legislation for the NYBG's incorporation. Brown, then president of the Torrey Botanical Club, financed Britton's work on An Illustrated Flora of the Northern United States and Canada, otherwise known as the "Britton & Brown Illustrated Flora." The two authors published the work in three volumes from 1896 to 1898. It became a standard for floristic studies of the time. By the century's turn Britton had established the NYBG as a scientific and educational institution of growing importance. A testament to its mission was Britton's selection of scientists that he developed and goaded toward greater achievement. His standing order was "Get it in print!" and he brought the labors of the NYBG staff to fruition by doggedly insisting on the immediate publication of results. In 1900, the Journal of the New York Botanical Garden was founded, providing an ready forum to do just this. Notable members of the early staff were Franklin Sumner Earle (mycology), Arthur Hollick (paleobotany), Marshall Avery Howe (phycology), Daniel Trembly MacDougal (plant physiology), William Alfonso Murrill (mycology), Henry Hurd Rusby (economic botany), Per Axel Rydberg (Rocky Mountain flora), John Kunkel Small (southeastern flora), Lucian M. Underwood (pteridology), Robert S. Williams (bryology), and Percy Wilson (Caribbean flora). In 1906 Britton, with Joseph Nelson Rose and Daniel T. MacDougal of the Carnegie Institute, embarked on a study of descriptive flora of the cacti. The result, published in 1924 after years of fieldwork, writing, and revision, was an exhaustive four-volume work, The Cactaceae by Britton and Rose. Henry Gleason later called it Britton's "magnum opus." An example of the many difficulties they faced was political and social unrest in Mexico. Stationed in Tucson, Arizona in 1906 MacDougal wrote to Britton, "the Yaquis are surely making the country mighty lonesome, and I have no desire to interfere with their plans just now." In 1902, the Brittons began the first of their annual excursions to the Caribbean, particularly Puerto Rico. His investigation of tropical flora set the stage for another major scientific enterprise that focused on Puerto Rico. At a New York Academy of Sciences meeting in 1913, Britton proposed a plan to conduct a comprehensive study of the island, to include botanical, paleontological, geological, anthropological, and archeological investigations. The "Scientific Survey of Puerto Rico" was a collaborative endeavor of the NYBG, the Academy, Columbia, and governmental bodies of Puerto Rico and the United States that lasted into the 1940s. The findings of this study were published in eight parts through the 1920s. With Percy Wilson, Britton published part 4 of the survey, The Botany of Porto Rico and the Virgin Islands. Descriptive Flora, the Spermatophyta. He also published related studies, The Flora of Bermuda (1918) and, with Charles F. Millspaugh, The Bahama Flora (1920). A biographical sketch such as this cannot begin to probe the details of such a productive life. Yet it is worth noting that among Britton's many achievements, he carried on a voluminous correspondence, assiduously pursued botanical collecting and personal research, purchased botanical collections, coordinated itineraries, attended countless scientific meetings, lectured to school children, promoted reforestation, and shared a life with his wife Elizabeth that was indeed a marriage of scientific interests. If they had a shared identity, it was evident in the splendid garden they created in the heart of the Bronx Valley. Britton retired in 1929 and spent his final years preparing a flora of Puerto Rico, the Flora Borinquena, an unfinished work. Elizabeth died in February, 1934, a seeming portent of his own demise; Britton soon followed her in death in June of that year. The Nathaniel Lord Britton collection consists of correspondence, research and personal papers, manuscripts and typescripts, lecture notes, photography, certificates, and a suede-bound presentation volume. It covers his professional career including graduate studies at Columbia College (1875-79), association with the Torrey Botanical Club, the founding and directorship of the New York Botanical Garden (1891-1929), and post-retirement years to his death in 1934. Information about Dr. Britton's publications, notably the Britton & Brown Illustrated Flora, and on botanical expeditions to Caribbean, including those relating to the Scientific Survey of Puerto Rico and the Virgin Islands, are well-documented in the correspondence and written materials. His field records are located in the NYBG Collectors' Field Notebook collection. Correspondence is divided into ten categories, the first being general correspondence primarily concerning specimen identification and exchange. The remaining 9 categories are organized by research projects which are associated with the publication of research findings. See Series 2: Research Papers and Series 3: Manuscripts & Typescripts for related material. General Correspondence. Consists of letters to and from Britton over the course of his career. Correspondents in this section may also have material in other categories that follow. Correspondents include Liberty Hyde Bailey, Charles E. Bessey, Alphonse de Candolle, Frederick Coville, Job Bicknell Ellis, William Farlow, Asa Gray, Albert S. Hitchcock, William Kellerman, Otto Kuntze, Auguste Langlois, James Macoun, William Maxon, Elmer Drew Merrill, Thomas Morong, Charles Peck, Thomas Conrad Porter, Sir David Prain, Charles Sprague Sargent, Roland Thaxter, William Thistleton-Dyer, and William Trelease. Scientific Survey of Puerto Rico. This correspondence relates to the Scientific Survey of Puerto Rico and falls into five time periods, 1913-23; 1923-26; 1926-30; 1930-32; and 1932-34. Files are alphabetically ordered within each period. Subject matter includes the planning and progress of the survey, coordination of research efforts, botanical collections, and official communications, including that with the government of Puerto Rico. Cactus Investigation Correspondence. There are 13 files concerning fieldwork and composition of Dr. Britton's collaboration with Joseph Nelson Rose from 1911 to 1925 on The Cactaceae (1919-24). J. N. Rose and Daniel T. MacDougal are the primary correspondents. Britton & Brown Illustrated Flora. There are 15 files of correspondence, chieflywith Addison Brown, co-author of An Illustrated Flora of the Northern United States, Canada and the British Possessions (1896-98). Subject matter includes the planning, financing, and composition of the work, including contractual agreements with Scribner's & Sons. Also present is Brown's own correspondence with Willis S. Blatchley, Robert G. Leavitt, John Kunkel Small, Charles Eastwick Smith, and R. Weber. The Bahama Flora. Consists of 7 files of correspondence. The Bermuda Flora. Consists of 7 files of correspondence with Charles F. Millspaugh and others, with an accompanying map of Andros Island. The Flora of Jamaica. Consists of 17 files of correspondence with William Fawcett, William Harris and others, organized chronologically. The Flora of Northern South America. Consists of 19 files of correspondence with Benjamin L. Robinson and others. Flora Borinquena. Consists of 9 files of correspondence with Frances W. Horne, her husband Charles E. Horne, Rafael A. Toro, and Carlos E. Chardon regarding the planned publication, financing, botanical data, and illustration of Dr. Britton's unfinished work on the flora of Puerto Rico. The research papers fall into 5 categories: (a) Scientific Survey of Puerto Rico; (b) Catalogue of the Flora of Cuba; (c) Flora of Northern South America; (d) Nomenclature; and (e) Miscellaneous. These contain committee minutes, reports, botanical notes, catalogues, descriptions, and keys. Scientific Survey of Puerto Rico. Research papers in this series consist of minutes of the Puerto Rico Committee of the New York Academy of Science (1913-34), minutes of the Committee on Mineral Resources of Puerto Rico (1932-34), and assorted topics relating to the botany of Puerto Rico. Catalogue of the Flora of Cuba. Consists of three files of notes on species. Flora of Northern South America. There are 2 files containing an outline of the project and a report on an expedition to Columbia in 1922. Nomenclature. This material consists of correspondence, meeting minutes, circular bulletins, and notes pertaining to the Committee on Nomenclature of the American Association for the Advancement of Science (AAAS) covering the years from 1892 to 1929 (6 files). There are 2 files of material relating to the International Botanical Congresses of 1892 (Genoa) and 1905 (Vienna), and one containing the constitution of the Botanical Society of America. Miscellaneous. Consists of three files of material. Materials in this series falls into 7 categories based on botanical research in specific geographical areas as follows: (a) Botany of Puerto Rico; (b) Britton & Brown Illustrated Flora; (c) Catalogue of the Flora of Cuba; (d) Flora of Northern South America; (e) Flora of Jamaica, and (f) Flora Borinquena. The last category (g) Notes on Polygala, is a genus study. Contents include annotated and edited typescripts, manuscript notes, and information on related work by other authors. The Botany of Puerto Rico. Consists of 8 files of manuscript notes on the flora of Puerto Rico published as Part 4 of The Scientific Survey of Porto Rico and the Virgin Islands. There are typescripts of Joyce Hedrick's work on lichens and J. George Harrar's work on schizomycetes. Britton and Brown's Illustrated Flora. This is a typescript of the first edition of this work published in three volumes from 1896-1898. The typescript is edited, with pasted line illustrations that accompany descriptions that are arranged by family. The typescript generally follows the format and sequences in the published volumes. See also drawings for the second edition (1913) of this work located in the NYBG Art & Illustration collection. Catalogue of the Flora of Cuba. This consists of 64 files containing a catalogue of species descriptions correlated with literature citations and plate numbers. In some cases dichotomous keys accompany the text. There is also a revised typescript and a Spanish translation. Percy Wilson and Brother Leon are named as contributors. Flora of Northern South America. There is one file on the family Caesalpinaceae. The Flora of Jamaica. There are 12 files of edited typescript with contents organized by family, with habitat descriptions and literature citations. Flora Borinquena. There are 19 files organized into 12 "batches" containing descriptions of plant anatomy, organized by family. There are also a duplicate copy entitled the "Frances Horne copy" and a "numbered copy" of which pages 1 to 198 are missing. There is an alphabetic list of species identified in the text, a published prospectus, introductory notes, and systematic descriptions. Notes on Polygala. Consists of 3 files of notes on species of with literature citations. This series consists of 4 files containing lecture notes on tropical and native plants in the NYBG collection, public education announcements, a dinner program, and a syllabus to courses given at the NYBG and Columbia University. The photography consists of phytogeographical studies of insular, coastal, and montane vegetation of New Zealand, with descriptive notes, taken in 1902 by L. Cockayne; a photo album of the Botanic Garden of Rio de Janeiro, Brazil, taken by F. Lawson-Scribner in 1903; and one file of personal photos. This series consists of 10 files and a presentation volume. There is a catalogue of Britton's personal herbarium (1875); a letter to his cousin, Ellie B. Turner; a letter of resignation to the NYBG (25 May 1929); and a paper on the Britton family genealogy and property on Staten Island. There is a suede-bound volume presented by faculty, staff, and students of Bronx public schools in appreciation of Britton's Nature Study lectures. Processed April 1999 by David Rose under a grant from the National Endowment for the Humanities (NEH) PA-23141-98 and a grant from the Harriet Ford Dickenson Foundation.